The National Bank of Austria has issued (16th October) their latest coin in the popular series “Austria – by its children” which utilities drawings and designs submitted by school children highlighting the outstanding landscapes or characteristics of their home provinces. This is the fourth coin released, and this edition focuses on the area located the furthest west in Austria, the Province of Voralberg. The mountainous region of Voralberg is in the far western corner of Austria bordering Germany, Switzerland and Liechtenstein. A small eastern corner of Lake Constance is the setting for the provincial capital city of Bregenz. The mountains and distance from the Austrian capital of Vienna has meant that much of its economy relies on Switzerland. Even the dialect of German spoken here is much more closely related to Swiss-German rather than the predominant Austrian-German of the rest of the country. The region is well known for its many dairy farms, cheese-making, world-class skiers and of course, the Bregenz Opera festival occurring every July and August on a floating stage in Lake Constance. The coin, struck by the Mint of Austria – depicts on the obverse, a lady wearing a spectacular handmade round bonnet crafted in gold lame lace – a tradition in this province. Both the skills to make these bonnets, as well as the bonnets themselves, are passed on from generation to generation. They have been registered as cultural world heritage items that need to be guarded for global safekeeping. These bonnets are time-consuming works of art, with each representing an average of 300 hours of handwork. The lady’s dress is the traditional “tracht” of the province which has been made even more dramatic with the inclusion of the finely worked lace collar. In the background is one of the many boats that ply the waters of beautiful Lake Constance. The “onion domed” baroque church of St. Martin’s in Bregenz completes the design on this side. The mint’s chief engraver Thomas Pesendorfer designed and engraved the obverse of the coin. The charming depiction of Voralberg on the reverse side of the coin is by 9 year old, Alissa De Mori who lives in the region in the village of Hoerbranz. She has included the best known parts of the province including 3 mountain peaks with coniferous forests, and a cable car just in front. A classic eastern European baroque church can also be seen with its characteristic onion dome on the steeple. Lake Constance is depicted with some of its many recreational boating uses. In the foreground is a lovely meadow covered with an abundance of flowers and grasses, along with a farm tractor and a cow. Thomas worked with Alissa to adapt her design by “translating” its original colors into a three dimensional design that could be readily struck onto a coin. 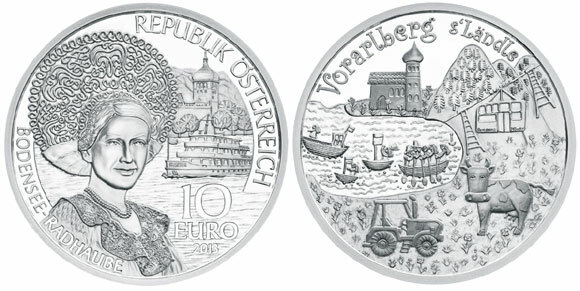 The coin’s obverse also features the country of issue, “Republik Oesterreich” Republic of Austria, the year of issue 2013, the face value of 10 euros and the name of the region, Voralberg. This commemorative coin is legal tender in Austria. *This coin will also be available in Austria only in the regular circulation finish and struck in copper. The copper coins have a milled or reeded edge whereas the silver coins have a smooth edge. For more information on this and other coins offered by the Mint of Austria, please visit their website at: http://www.muenzeoesterreich.at/eng/produkte/vorarlberg Information offered in German and English – international orders fulfilled.